There are obviously a lot of opinions about the effectiveness and relevancy of the growing Occupy Wall Street movement. Some view it as a disorganized protest that lacks a cohesive message. 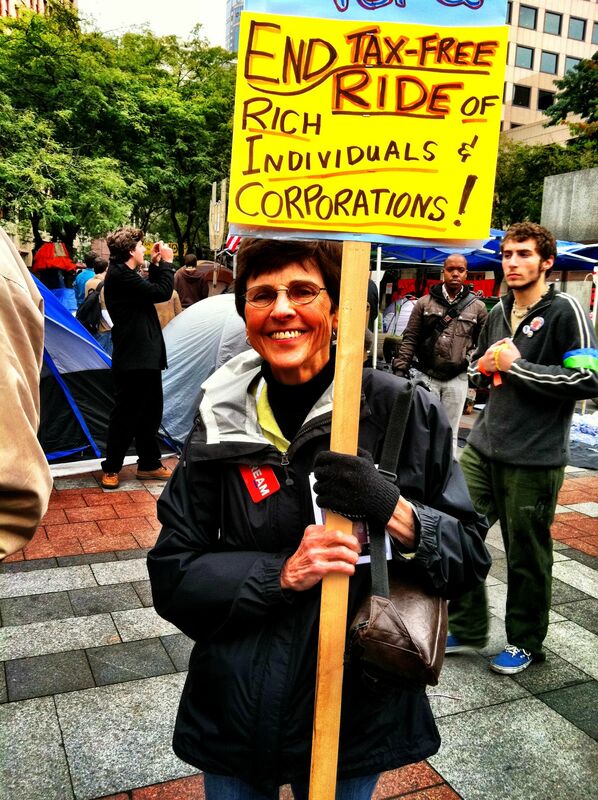 Others see it as a significant outcry against an economic/political system that is run amok by greed and corruption. The debate ticks on. But meanwhile, the movement is spreading to major cities (and one Alaskan tundra) throughout the world. Even though the big picture ramifications are still uncertain, the spirit of Occupy Wall Street is resonating across a diverse spectrum of the American population, or so it seems. 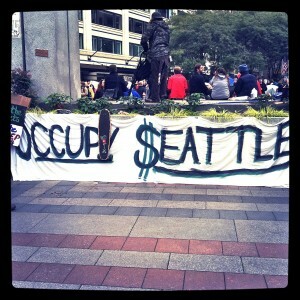 I decided to investigate for myself and last Sunday, I paid a visit to Occupy Seattle. There was no single “type” of protester. The people were as diverse as the population of the United States: schoolteachers from the suburbs, college kids, old hippies, war veterans, moms with babies in strollers, gay couples and modern day flower children. There were grandmothers in feather boas sitting with anarchists wearing bandanas across their faces. There were lots of teenagers, some of which had the ragged look of homelessness. 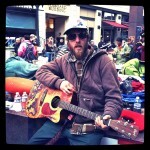 Some people had been camped out since day one of the occupation. Some had just dropped in for the afternoon. There was a group leading songs and dances to whomever would participate. There were also people leading workshops on a variety of topics. I observed part of a workshop on sustainability. Some of the people at Occupy Seattle were employed. Many were not. While there was some ethnic diversity in the crowd that afternoon, I would say that the majority of the people there were white. And of course, there were signs everywhere. The slogans expressed anger, intelligence, outrage, humor and hope. 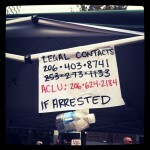 I circulated through the crowd, taking photos and talking to people. 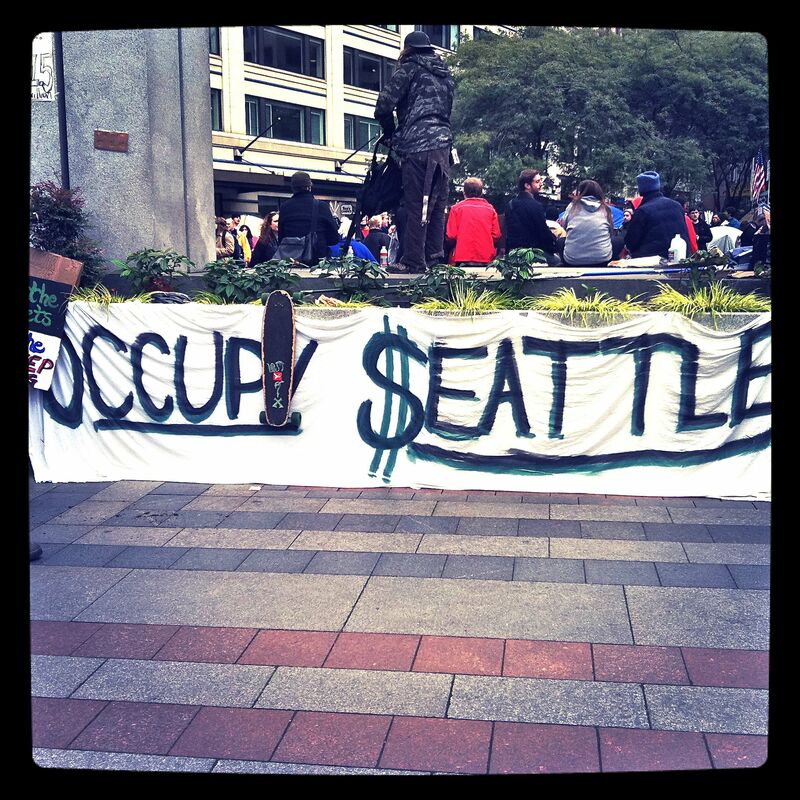 I asked people why they were there and what Occupy Seattle meant to them. Although the movement has been criticized for its lack of a focused message, all of the people I talked to shared a common sentiment: they are fed up with the stranglehold that corporate interests have on the American political system. They want accountability and economic justice. There were a wide variety of opinions on how to achieve these. There was much discussion about the economic crash, how we got there and what we need to do to get out of it. Almost everyone I spoke with had, in one way or another, been negatively impacted by the colossal downturn. People expressed a host of secondary concerns, everything from genetic food engineering and education cuts to sustainability and the wars in Iraq and Afghanistan. One man even volunteered his opinion that the collapse of the U.S. economy was because of “women and marriage.” But ultimately, all conversations found their way back to the corporate influence in politics. I might note that I definitely picked up on a general suspicion of and distaste for law enforcement. This seemed to be reinforced by what appeared to be a sheriff department’s helicopter hovering overhead. 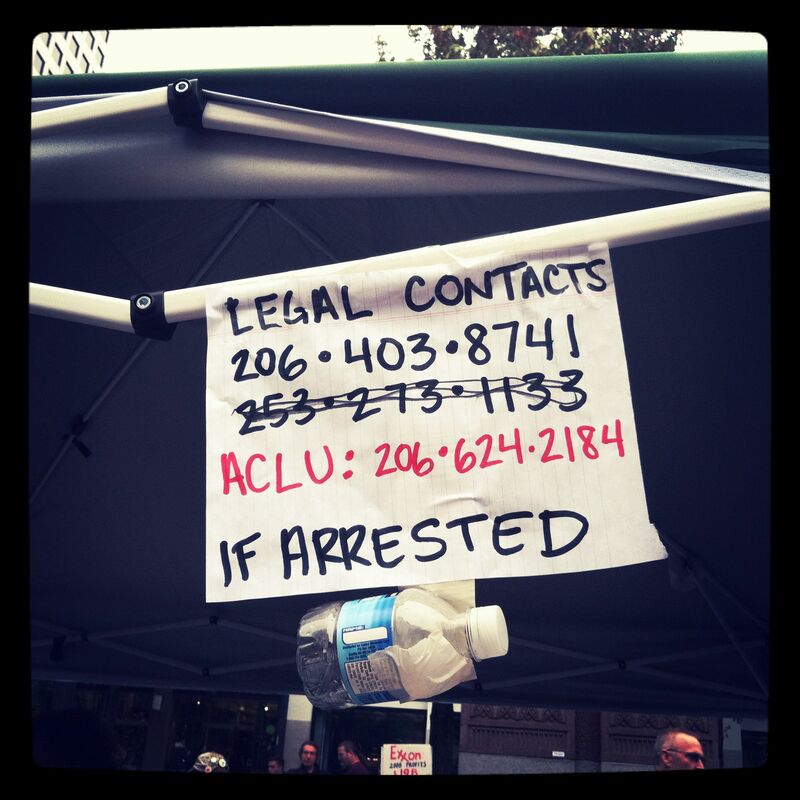 The Seattle police were definitely a presence, but officers kept themselves at a distance, at least while I was there. I found basic humanity and a great deal of hope at Occupy Seattle. I was particularly struck by a young woman named “Rose,” who had some interesting thoughts on creating a “new American dream.” She talked about how in other cultures, people live in close proximity to their extended families. In her vision, we use this model to build small, local communities where people take care of each other. I’ve contemplated a similar scenario myself, and my conversation with Rose left me with an odd sense of comfort. Maybe my tribal inclinations aren’t so far-fetched. 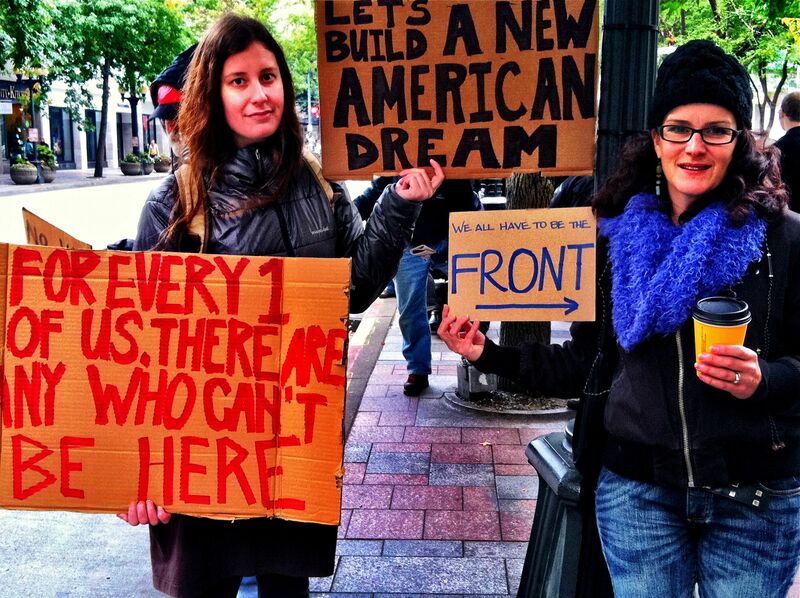 Many people have made the observation that the time and energy that is being poured into the Occupy Wall Street movement and its attendant offshoots would be better spent working within the political process to change the status quo: voting and working on behalf of candidates that support the cause. However, the majority of the people that I talked to on Sunday sincerely believe that the system is too broken to be effective anymore; the democracy that we grew up to believe in isn’t as it seems. While I’m not sure I’m ready to wholly concede that, I do believe their sentiments are earnest and justified. Things are abysmally messed up right now and the power of the individual to truly effect change is, at present, ambiguous. I am a single mom. Dealing with the throes of an ongoing recession and the daily struggles that go with it is lonely and scary. 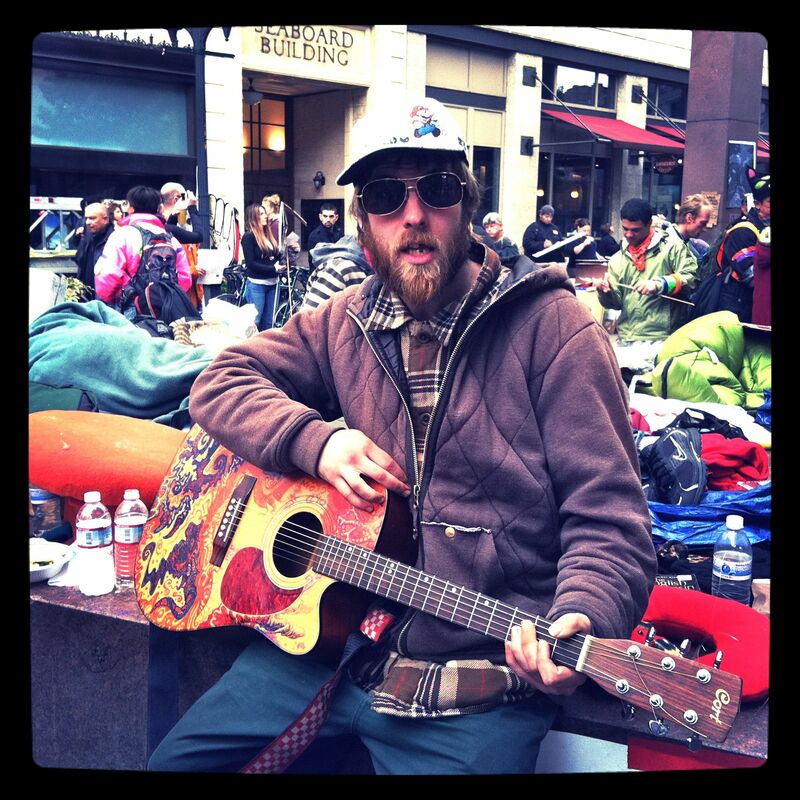 But as I walked away from Westlake Center on Sunday, I knew that I wasn’t alone. I felt connected to almost every person that I talked to. 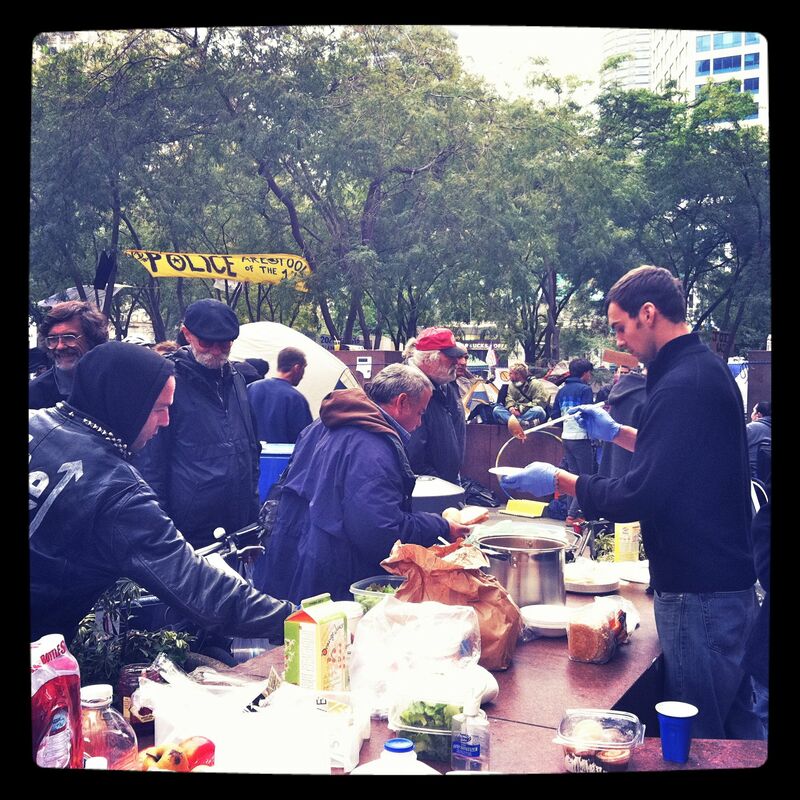 Rather than viewing it as an unorganized collective without a focused message and a clear strategy, I prefer to think of the Occupy Movement as a work in progress. Dissidence is the foundation of radical change. Our Founding Fathers….the guys who had the balls to give the British Empire the middle finger…knew this. We may or may not have a revolution. It’s too soon to tell. 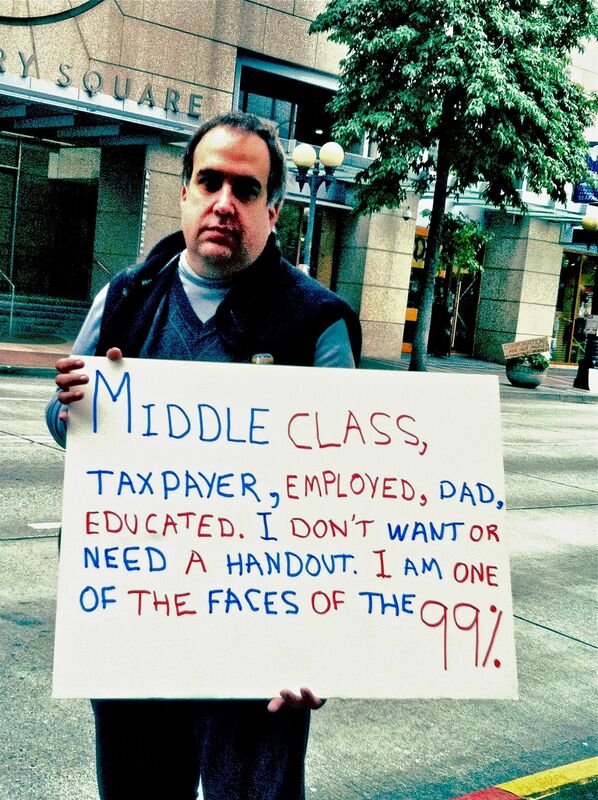 But the Occupy Movement should not be underestimated or dismissed. These are intelligent, compassionate people. Surely some good can come of this. 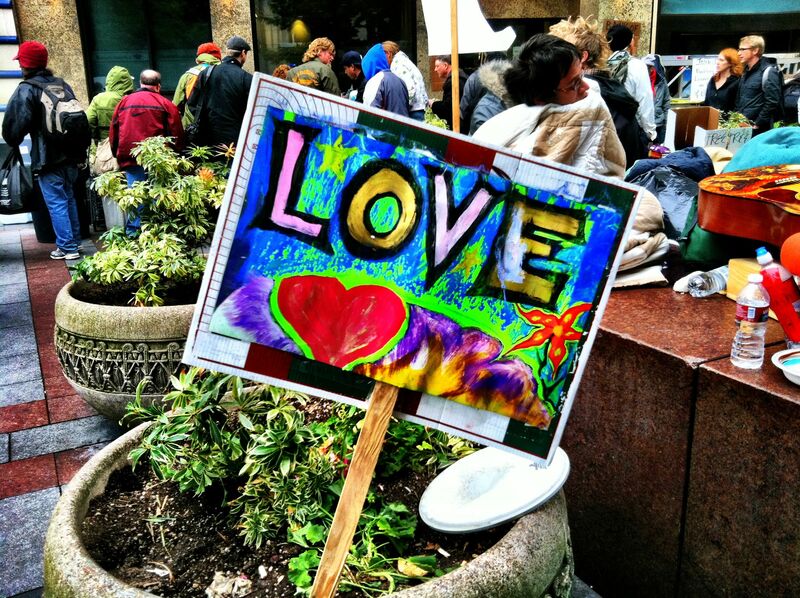 *The day after I visited Occupy Seattle, the encampment was broken up by the Seattle police department. 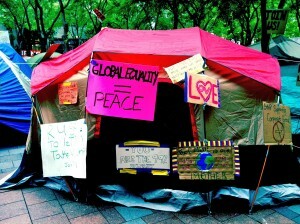 Although there are no tents, Occupy Seattle is maintaining its presence at Westlake Park.